Lories and lorikeets, like all animals need food to survive. Unlike many other birds and especially other parrots, they have a rather specialised diet consisting mainly of liquid nectar, pollen from flowers and liquid from fruit and squished things, everything from occasional seeds and greenery to insects! 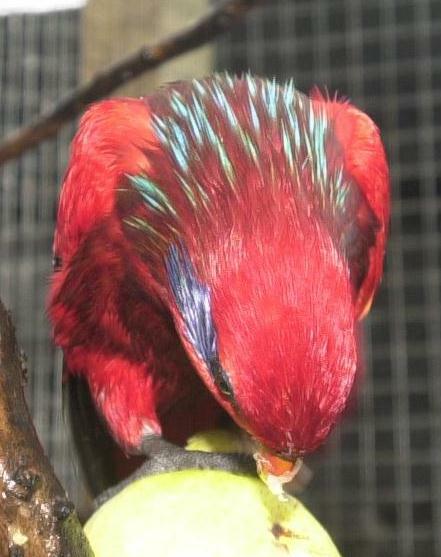 When a Lory is kept in captivity it is not too easy to obtain real nectar or provide a continued diet of flowers so they can extract the pollen. This is where the substitute nectar comes in and fortunately it is not too difficult to make a pretty convincing nectar substitite, one that is more than acceptable to the Lory. 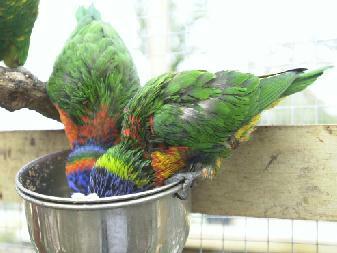 Many Lory owners have their own ideas about making nectars, or wet-mix as it is often called. Not every bird likes the exact same wet-mix formula and with some experimenting it does not take too long to find out what favourites an individual bird has. But its not just wet-mix that we should feed to lories. They also like a varied diet with fresh fruit being a special delight, various vegetables and greens should also be included from time to time. Dry-mixes are also very popular and along with a suitable water supply can supply a lot of the lories nutritional requirements. 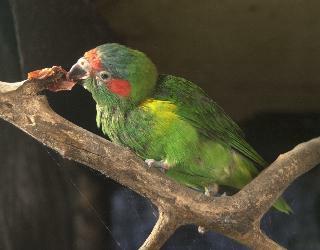 Lories also like to eat cooked chicken and chop bones, grained breads, millet sprays, bottle brush flowers, wattle flowers. 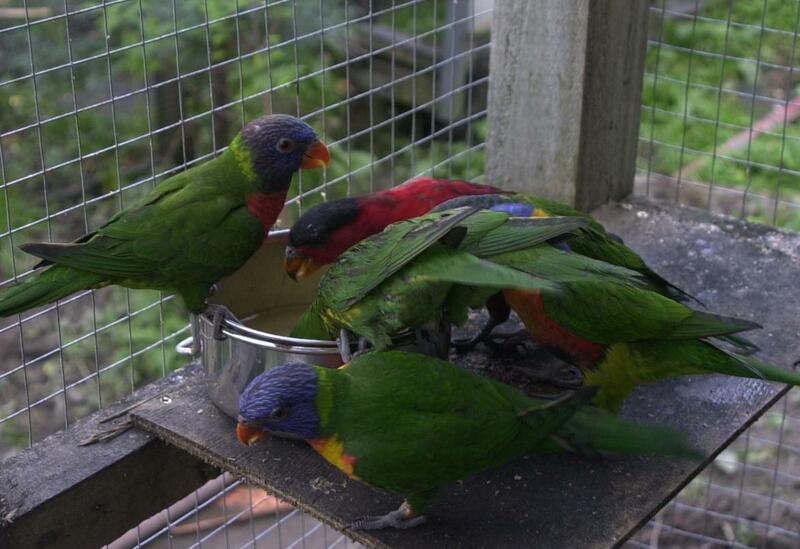 It is wise to include a vitamin and mineral supplement in your lorikeets diet. These sorts of supplements are available at most good pet shops. Ornithon is one of the better known examples. Lories should be fed at least once a day, preferably several times a day. It is better to replace small amounts of food several times a day rather than have a lot go stale after a few hours. Lories, like humans, enjoy fresh food so if you have the time available then feeding several times a day is recommended. Whether inside or outside a container of clean water should be available at all times, this may need to be changed quite often as lories will often dunk their food into water and quite quickly it will become very contaminated. 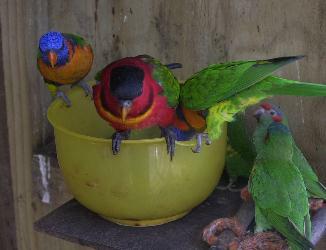 Separate drinking water and bathing water containers are needed. .
Below are listed some food items that should be avoided at all costs as they will often be or are guaranteed to be detrimental to the Lory's well being and in the worst case could lead to a very ill Lory or even a dead Lory. 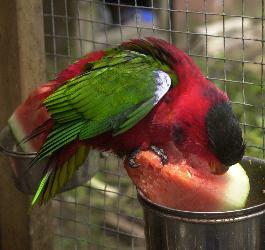 - Avacado is one of the few stone fruits that must not be fed to a Lory. 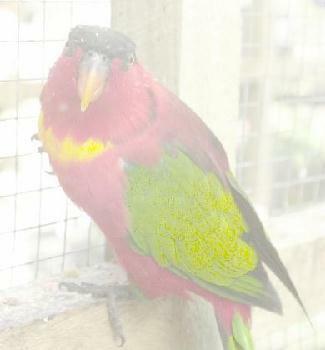 There are several commercial dry and wet mixes available for lories and lorikeets. These tend to follow well established and successful formulae and are packaged in several sizes. Most pet stores will make their own mixes or purchase them locally and package them in sizes from several hundred grams to several kilograms. The larger the size then usually the better the value as packaging costs greatly influence final pricing. 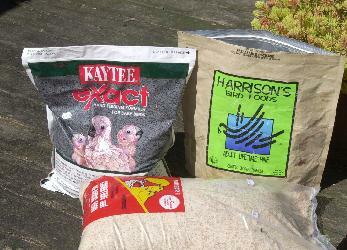 Pictured below are several commercial mixes, at the bottom is a Dutch formula wet-mix that is very popular (NZ$38 for 5Kg), left is Kay-Tees, a USA manufactured wet-mix that is excellent for hand raising baby lories (NZ$65 for 2Kg) and Harrisons Bird Foods, a pellet based organic food that is advertised as a complete Lory diet ($114 for 2.5Kg). 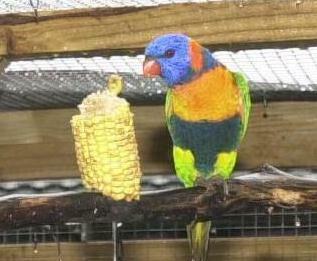 Many fruits, vegetables and greens are suitable for lories and lorikeets. You may need to experiment and offer different items as birds can be quite different in their food likes and dislikes. 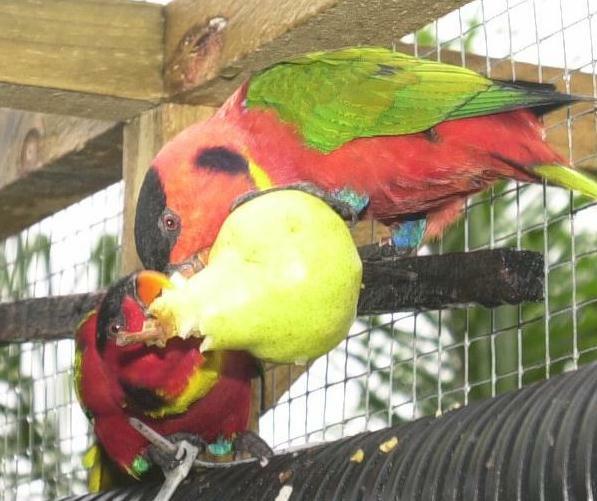 Listed below are some of the foods that have been successfully fed to lories. - Cherries, once they are over ripe and bursting with juice. - Lories will enjoy the ocassional meat or fish. Cooked chicked necks appear to a favourite with many lories and cooked or canned fish, such as tuna, can also be quite popular. 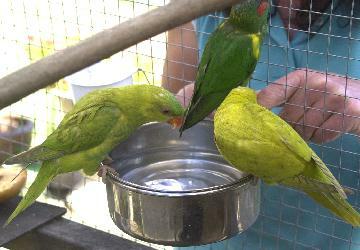 Many sizes and shapes of food dishes are available for pet parrots. These range from simple plastic moulded types to better quuality metal types - usually stainless steel. The most common and easy to keep clean food containers are the round stainless steel cups usually mounted in a wire frame that is hooked onto the wire of an aviary. They are generally available in several sizes from small enough for a single bird to quite large sizes suitable as water containers for birds to bathe in. These are recommended because they can be soaked and easily washed then sterilised in an apple cider solution. These cups can also be washed in a dishwasher where the heat drying will guarantee complete sterilisation. The only unfortunate aspect of these versatile cups is that often the supporting wire frame is made from chromed steel and this will always eventually get covered in rust. This rust will in turn actually start to rust the stainless steel cup if it remains in contact for very long. The support wire frame will need to be wire brushed once it becomes rusty as flakes of chrome will detach and if swallowed by a bird could be fatal. No matter which type of container is used for food it is of the utmost importance that the containers are properly cleaned and sterilised on a regular basis. If possible a second set of containers should be available so that a clean container can be used at least every day or more often if the lories are fed more than once a day. Washing is essential to prevent buildup of potentially dangerous bacteria in stale leftover food. On a hot day food will tend to go off quite quickly promoting the growth of bacteria. Home made wet and dry mixes have several advantages over purchasing ready made mixes from a pet food supplier. First they should be more economical as directly buying the ingredients will allow you to shop around for the best value brands and quantities, many of the ingredients are available at bulk food discount stores (such as BINN-INN and Woolworth's supermarkets in New Zealand). Second, you know what exactly is going into the mix and you can choose to use only ingredients you approve of, avoiding preservatives and colouring agents, free flow agents etc., or use only organic approved ingredients. The important point is that you have the choice. Third, you can adjust the actual contents of the mix to suit the availablity of seasonal items, provide extra conditioning items to improve plumage, assist with egg development, build up younger birds etc.. and the birds will find variations in the mixes more interesting. Blend all together in a food processor so it becomes a fine powder but not too fine and store in an air tight container. This mix can be offered dry or to make into a wet mix just add a small amount of honey and warm water to mix to a runny consistency. To make 1 litre, enough for about 10 birds. The quantities can be scaled up or down depending on the number of birds to feed. This wet mix should be used the same day it is made although it can refrigerated for two or three days. 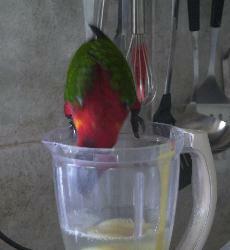 Don't blender the impatient bird! Last modified: 13 February 2002.